FÁILTE IRELAND IS encouraging people to get out of bed in the wee hours of the morning and gather in Galway to welcome the Volvo Ocean Race back to Ireland this week. Fáilte Ireland is the port partner for the grand finale of the Volvo Ocean Race and has put out a nationwide call to encourage the people of Ireland to gather in Galway to welcome the participants back to the country. The teams will have have travelled 39,000 nautical miles around the world to finally make it to Galway. On the way to Galway is a fleet of six boats, each with eleven crew-members. They are travelling from the Breton city of Lorient. Kerryman Damian Foxall is serving as watch leader (the overall race leader) on French entry Groupama, which is currently the overall race leader. This is Foxall’s eighth race around the world but he admitted he is nervous about winning in front of a home crowd. It’s our race to lose and anything but overall victory would be a disaster for us. It is totally possible to lose the race from here. Throughout the race, the sailors and shore-teams who were in Galway last time have all be talking about their incredible experience there. We’re all aware of the extraordinary effort being made in Ireland this time so we’re looking forward to it. Those looking to welcome the fleet will have to set their alarm clocks early – or just not go to bed at all, as the estimated arrival time of the fleet is between 12am and 3am tomorrow, Tuesday July 3. The vantage points at Galway’s Quayside are where people are encouraged to give the teams a huge céad míle fáilte. If travelling to Galway for midnight is not possible for you, you can watch the finale (while in your pyjamas) streamed live on www.volvooceanrace.com. Information on the race has been transmitted in real time through a dedicated Twitter account, Galway Buoy. The eight-metre high buoy is fitted with multiple environmental sensors and electronic transceivers in order to give the most detailed updates on how it is progressing. Email “Fáilte Ireland: Get out of bed and welcome Volvo Ocean Race”. 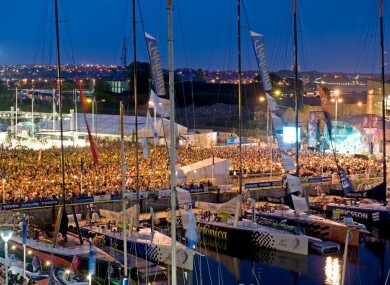 Feedback on “Fáilte Ireland: Get out of bed and welcome Volvo Ocean Race”.